Without a blueprint, it would be really hard to construct a building. Without a road map, you'd be lost! Scale drawings make it easy to see large things, like buildings and roads, on paper. Even a GPS uses scale drawings! Check out this tutorial to learn all about scale drawings. 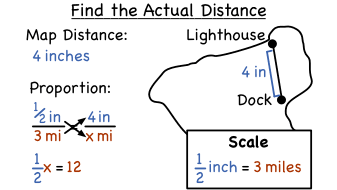 This tutorial provides a great real world application of math! You'll see how to use the scale on a house blueprint to find the scale factor. Then, see how to use the scale factor and a measurement from the blueprint to find the measurement on the actual house! Check out this tutorial and see the usefulness blueprints and scale factor!